Where: Waterford Regional Fire Department Training Academy -2495 Crescent Lake Rd. Connections Business Services will share critical presentation skills required for a successful trade show experience. Talk to successful vendors and see various booth set ups that work for them! Click here for more information about the 2019 Live, Work, Play EXPO! 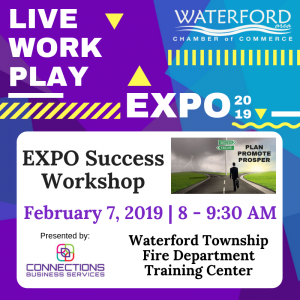 Click here to sign up for the 2019 Live, Work, Play EXPO!